Why SHA and CIA? Harris Mayer-Selinger, SHA ’06, CIA ’07 would tell you it is all about understanding where you want to go in life and for him, becoming a restaurateur has always been his passion. A native New Yorker, Harris knew the big city was his milieu and immediately set about learning the NYC restaurant scene after graduation, with stints in large and small restaurants. These experiences, as well as travel to France, China, and Taiwan, helped him compare disparate leadership styles and hone his own culinary style while becoming adept at menu development. 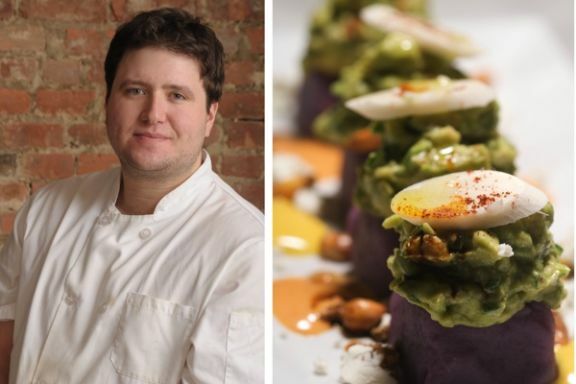 While the chef at “Wine Bar”, Harris was recruited for the project next door, Matthew Kenny’s opening of Bar Paya, a unique Peruvian style restaurant in the East Village. This was eye-opening from another perspective, as Harris learned about the permitting and regulations governing new restaurants; “NYC is so regulated and the rents are so high, you have to understand the environment and really crunch your numbers carefully to open a new restaurant”. Now, as Head Chef at Bar Paya, Harris is putting his knowledge to full use. He has travelled to Peru to develop his authentic style, a trait which is important in everything he does. “As a chef or manager, the standard is set by you” he notes “and the quality of every plate you send out the door becomes the expectations and the standard your staff will strive to reach”. He is intimately involved with the finances of the restaurant, public relations efforts and staff management, activities Cornell prepared him for, in particular “how to communicate in a professional manner and the theory behind running a business”, but he also understands intrinsically how every detail is important. “Every day is about doing a lot of the small things correctly” he says, a proficiency he developed during his time at the CIA, where tips such as stretching a cut of meat or how to adroitly calculate the cost of each menu item in relation to other items is integrated into every discussion. So now he is taking all he has learned and focusing on guest satisfaction; he uses the best quality ingredients and is intensely aware of the sophistication of the diners in NYC. His advice: “Respect your customers by showing integrity in your menu; never assume your guests won’t notice a change because they will”. Find out more about Harris’s Peruvian cuisines in his interviews with PaperMag and am New York.